Attukal Pongala is a world famous festival celebrated annually at Attukal Devi Temple,Thiruvananthapuram in Kerala. 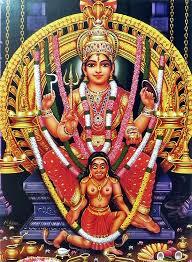 Attukal temple is known as the “Sabarimala of Women”. On Pongala day,the largest gathering of women devotees in the world in a single place on a single day irrespective of caste or religion to offer pongala(special naivedya)to Attukal Amma. Attukal Pongala is a ten-day long festival which falls on February – March every year (Malayalam month of Makaram – Kumbham). The festival begins on Karthika day of Malayalam month Makaram with the traditional Kappukettu and Kudiyiruthu ceremony.The 9th day of the festival is the famous Attukal Pongala and the festival will conclude with the Kuruthitharpanam at 10th day night. On Pongala day, millions of women devotees throng to the temple to offer pongala to Attukal Amma. which begins with making fire in the temple hearth known as Pandara Aduppu. The fire will then be passed to the women ready to offer pongala and the same fire spreads to all the tens of thousands of women, who are offering pongala. 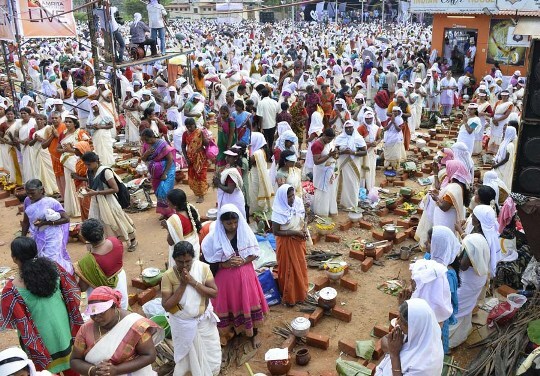 millions of women build millions of fires in the open street and prepare a pot of rice(special naivedya or Pongala) on the flames.Â This day, turning the whole of Thiruvananthapuram City into the holy grounds for the women to offer Pongala. All the transport buses servicing from the city are reserved for women on Pongala day. Kuthiyottam performed by boys and Thalappoli by girls are two popular rituals made on the Ponkala day.The young girls dressed in traditional way and holding Thalapoli starts very early in the morning. The Boys below the 13 years participating in Kuthiyottam. The Attukal Pongala 2018 Festival begins at Attukal Bhagavathy temple, Thiruvantnhapuram on 12th February 2019 and concludes on 21st February 2019. The world famous Attukal Pongala offering is on February 20, 2019, Wednwsday. Pongala ritual commences at 10:15 AM on February 20th, 2019 and its will be offered to Goddess at 2:15 PM.